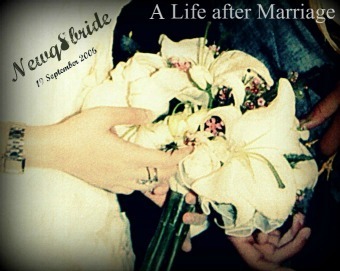 NewQ8Bride : A Life after Marriage: what is happening ?? I want to race Jojo .. for your love. I might be wrong, but I got the impression from previous posts that jojo doesn't let you go out.. You don't "have" to be together every weekend.. You're together the whole week, you don't have to wait for the weekend to do something. Find your friends, and go and have fun with them. When u're with someone 24/7 et9er malaqa. U need time apart, it's good for both of u, and at the end of the day when u'r together u have something to talk about. But I do know where you're coming from. If you love someone u wanna be with them all the time... I wish you the best, dear. what kind of racing is it ? hun. i wanna tell u, we just came back from our trip to bahrain, 3/4 of the time in the car back we were kissing and smoochin' but we had a couple of fights as well.. so i would say its normal to be mad at ur husband , or him mad at you.. or having unexplained silly fights. i keep telling Ot not to watch prison break without me.. i consider it our time together , and he's like.. but we are always together! true.. yet i wish to have our special involvements not only just BE together. i agree that couples need time apart, but you don't have to leave the apartment to be apart.. u can leave the room, call ur friends, invite friends over while ur husband is away for something, or go out with your friends.. that way its a really healthy break.. actually.. Ot was mad at me for a silly reason, yet it was my fault. i had to be silent for more than 5 hours, what i did was have a bath do my hair pampered myself.. until he calmed down and came back to me.. no apology was needed even (not that i would mind). another thing.. u think that ur husband might not be aware that he is married.. why.. is racing a time consuming matter? would you rather he has another hobby? .. or no hobby? take it easy and dont worry. everything will fall into place. btw your title for the blog, do you realize marrige is spelled wrong. it's marriage. just pointin it out. marrige is the correct spelling idiot.